The NBA has been hiring head coaches with “outsider” resumes for years, they’ve just rarely been minorities. Becky Hammon will be the first woman ever to be interviewed for a head coaching position in the NBA. Unsurprisingly, she has an impressive resume. Hammon is a decorated former WNBA star. She was inducted in the New York Liberty’s Ring of Honor in 2015, and the San Antonio Stars retired her jersey the next year. She has been an assistant coach for the San Antonio Spurs since 2014, and also coached the Spurs’ Summer League team to a title in the summer of 2015. Hammon has been up for big promotions before. She interviewed for the position of general manager of the Bucks in 2017, though she was not named one of the finalists for the job. And she hasn’t been the only Spurs’ assistant to be interviewed for a position this year: James Borrego was just hired as the coach of the Charlotte Hornets. Yet, some people are concerned that she’s skipping the line. That is to say, they believe she hasn’t earned the right to even be considered for an NBA head coaching position. The argument goes that she doesn’t meet the necessary requirements candidates for NBA jobs usually have to fulfill, and she’s being pushed ahead of more deserving individuals by virtue of being a woman and having worked for Gregg Popovich. - less than 5 years assistant coaching experience, of which all has come from the second row. Note: This debate largely isn’t centering on whether Hammon is good enough for the job — no one really ever knows which assistant coaches will make good head coaches, anyway. Instead, her interview is supposedly evidence that her advancement is due to favoritism and political correctness. Never mind that Hammon is trying to advance in a world where the news of her interview is being met by people like Mike Francesca saying that there’s no way or reason why a woman should be the head coach of an NBA team. The idea of requirements theoretically has something to do with “merit,” but the idea of meritocracy as a whole is a sham. Meritocracy is often strictly applied against minority groups, or outsiders, rather than earnestly against all people. It’s not hard to imagine someone using a similar set of rules to dismiss a lot of minorities who desire to be coaches. Like, for example, insisting an NBA head coach needs NBA playing experience. Hammon is a woman. Because of that, some would argue she should have been disqualified at birth from ever being an NBA head coach, even though she was a brilliant player. In this scenario, Hammon’s long career in the WNBA is inconsequential, because evidently the concepts in men’s basketball are so mystical she couldn’t possibly understand them without ever having played in the NBA, even after coaching in it. And yet, if that’s true, then there are a lot of male coaches whose resumes, like Hammon’s, can be picked apart using a rubric like Elhassan’s. Jason Kidd was hired as a head coach right after retiring from playing, without ever having any meaningful assistant coaching experience. Luke Walton played and was an assistant coach for only three seasons before he was hired as head coach by the Lakers. Byron Scott was hired by the Nets after only two years as an assistant with the Kings. Steve Kerr was an analyst, president, and general manager before he was hired by the Warriors. Mark Jackson was also an analyst before he coached the Warriors. It goes on: Mike Budenholzer didn’t play in the NBA. Brad Stevens didn’t play and was only an assistant and head coach in college basketball. Alvin Gentry had no meaningful head coaching experience before coaching the Heat in 1995. Erik Spoelstra was famously a video coordinator before he was an assistant then a head coach. He never played. The idea of “requirements” only really function to exclude people like Hammon. Claiming favoritism now is especially bold. A lot of NBA coaches, as with any job, got their opportunities because of recommendations from their former bosses, friends, or associates. Some of those coaches mentioned were assistants to Popovich as Hammon is now. That’s how hiring practices work. Who you know goes a long way toward determining the jobs and opportunities that you get. There is space, however, for healthy skepticism around a white woman with an influential sponsor like Popovich having the opportunity to interview for jobs in the NBA, while qualified black and other minority candidates still struggle for recognition. But that skepticism about the league’s hiring bias shouldn’t somehow become entangled in a weird dismissal of Hammon’s qualifications. Rather, there is an argument to be made for equality of opportunity for everyone. That’s not to diminish the accolades of any NBA head coaches who got jobs — they went through their own struggles, and put in a lot of hard work, too — but to show that there’s no strict path to being an NBA head coach, and there shouldn’t be. There isn’t with most jobs. Few would argue the point except when a true outsider is involved. Even if we entertain a scenario where Hammon is circumventing the system, the fact remains she has had to find a way to advance in a world that has little conception or history of women in powerful positions, a world actively trying to reject her. She joined a company of just two other women in history to coach in the NBA — Nancy Lieberman and Jenny Boucek — when she joined the Spurs’ staff. 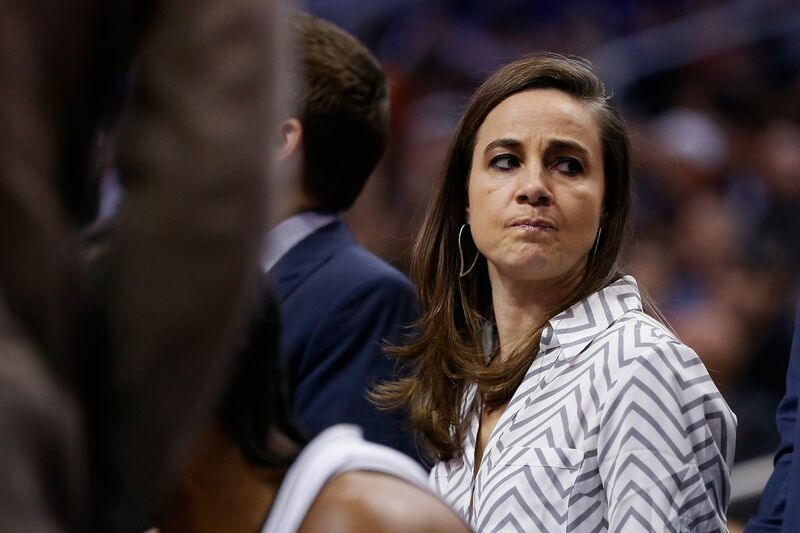 By being a woman NBA coach, Hammon is questioning the same structure preventing aspiring minority coaches from realizing their potential, just from a different angle. Neither shares the exact same struggle, but the conclusion through both prisms is there needs to be an opening up of opportunities, so the system isn’t biased against race or gender. Black and minority coaches shouldn’t have to prove themselves as players just to get the same interviews as white coaches, and there should be more women working in the league. Hammon is hopefully the first of many. And a true meritocracy ought to help their causes. Whether Hammon will be a good coach will be determined by what she does if she gets the job. To suggest she doesn’t even deserve an interview, that she’s skipping the line, is to dismiss her expertise and her struggles to carve a path in a male world. It’s to pretend everyone but her has gotten their opportunities based only on merit. It’s to hold her to a standard that doesn’t really exist. If the argument that there’s a Proper Path to being a head coach is there are other candidates who deserve to be interviewed as well, then we should petition for a hiring process more fair to everyone. Our instinct shouldn’t be to disparage one individual just for getting her chance. 10 reasons Damian Lillard’s series-clinching 3-pointer is legendary Dame stepped back for a 37-foot three to beat OKC. Unreal. The Nets-Sixers series ended with the most pointless beef In the final minutes, Jonah Bolden, Rodions Kurucs, Greg Monroe and Dzanan Musa were ejected. Yep. It’s always Dame Time somewhere We have that and more in Wednesday’s NBA newsletter. Duke’s recruiting class is No. 1 again. How good are they? A look at what’s next for Duke after putting the finishing touches on another No. 1 recruiting class. The 76ers’ self-imposed moment of truth has arrived Who will the 76ers be in the future? That’s a question these playoffs must answer, which is why they matter more than they do with any other team.